Azides Uses, Properties, Toxicity and Safety, Detection and Safe Decontamination and Destruction. Azides are compounds which contain three nitrogen atoms connected to each other, -N3, where the letter N denotes an atom of the element nitrogen. The subscript 3 signifies that three nitrogen atoms are bonded to each other. The free arm written as – denotes that the three nitrogen atoms of the azide are connected to one other atom. One has to distinguish between organic azides and inorganic azides. In organic azides, the three nitrogen atoms are connected to a carbon atom and in inorganic azides they are connected to a metal such as sodium or lead. All azides are notoriously unstable and can decompose easily. Many inorganic azides are in fact explosives as are some of the organic azides. The gas-producing material in automobile air bags. As chemical preservative in hospitals and laboratories, e. g. as preservative for vaccines and other drugs. As pest control material, mainly in agriculture. As an ingredient of certain drugs. Heating azides, or mixtures which contain azides, results in a rapid decomposition of the material, and often in an explosion. This process releases a large volume of gases. This process is the basis of the use of azides in automobile airbag, where the gas released inflates the bags which prevent the impact of the head of travelers with the car interior parts during collision. Azides are very toxic materials to viruses and to living cells, including cells of bacteria, fungi as well as mammalian cells, i. e. human cells. That is why they are used as preservation materials for vaccines and as poisons in pest control. Certain drugs, like the AIDS drug AZT, contain the azide group in their molecule. Inorganic azides are not very stable compounds and often are very labile explosives. In particular, they tend to explode when a hard object impinges on them or scratch them. One such material is the well-known lead azide, Pb(N3)2. Because of the extreme sensitivity of these azides to impact, lead azide has been used as the percussion-sensitive primer at the end of the shell of cartridges. When the hammer of the gun impacts the primer at the casing end, the primer ignites and the propellant inside the bullet casing explodes a large volume of gas forms in the casing which propels the bullet to the target. The azides of copper, silver, mercury and, barium behave in a similar way. While sodium azide is water soluble, many inorganic azides are not soluble in water. Since most water streams contain some heavy metals such as copper, lead, mercury, iron nickel, etc. disposing of solutions containing sodium azide into water streams such as sewer water can result in the precipitation of insoluble azides such as lead azide. Since these insoluble azides are explosive, great care should be exercised to prevent thier precipitation and accumulation in sewer lines and sewer holes. Acidic solutions decompose azides and form the volatile and extremely toxic and explosive hydrazoic acid, HN3. This volatile acid evaporates and forms toxic gaseous mixtures. Acidifying solutions which contain azides should be done very carefully in hoods or well-ventilated areas. Azides can be incorporated into the body by breathing vapors, droplets or dust containing azides, by skin contact-mainly with solutions or vapors, or by ingestion of solids, solutions or food containing azide. Note: Wet skin absorbs all forms of azides faster than dry skin. Since azides are not very stable, and may decompose on route into the body, the most dangerous mode of absorbing azides is as vapors or droplets, mainly into the eyes or the skin. Formation of explosive materials and breathing or ingesting toxic materials formed in the explosion. Chronic toxicity due to exposure to small doses of azide over a long period of time. Danger due to the energetic nature of the explosion. Breathing hydrazoic acid vapors that were formed as a result of the decomposition. The main explosive azides are lead, mercury, copper, silver and barium azides. These azides maybe encountered in bullets and in home-made explosives. Mixtures of azides, mainly sodium azide, with materials such as chlorine or fluorine-containing compounds, often polymers, are used in airbags and in other applications. Mixtures of sodium and/or of other azides, with powdered metals, mainly aluminum powder, are also explosive. Firing of bullets due to unplanned heating or percussion of bullets casing. Although some injuries have been recorded due to untimely and accidental explosions of air bags, on an overall balance, many more lives have been saved by airbags then hurt by azide explosions. No cases were reported of injuries or poisoning due to breathing azide vapors from the azide in airbags. Exposure to “large” amounts of azide will produce short term toxicity and possible death due mainly to its effect on the transition metal ions in the body, predominantly the iron. Ingesting azides interferes with all the biochemical processes which involve iron. It affects the neurological system and the heart. Both di and tri valent iron form in the body iron oxide, FeO as a result of the decomposition of their complexes with the azide ion. The iron oxide forms a colloid or a solid precipitate which cannot fulfill its biochemical functions. This effects most predominantly the capture and transport of oxygen from the lung to other body parts and thus results heart, breathing and nerve system physiological damage including possible death. Repeated exposure to small doses of azides, i.e. chronic exposure to azides, results in damage to nucleic acids and certain enzymes. Although some of these materials are normally replenished in the body relatively rapidly, the damaged molecules may be incorporated in chromosomes and damage them. Exposure of females in the child-bearing age should be particularly prevented due to possible increase the probability of birth defects and mutations. This is much less important in the case of males in the child bearing age because of the rapid renewal rate of sperm cells. Avoid breathing gases formed after an air bag inflated in a car accident. Do NOT manhandle or disassemble air bags or their inflation mechanism. Avoid acidifying solutions or suspensions of azides, this will release very toxic gases including hydrazoic acid. If this has to be done, please do it in a fume hood. Avoid heating solids or solutions that contain azides. Acidifying azide solutions with concentration smaller than 5000 ppm may be done slowly with constant stirring. If you have a choice of the acid, use phosphoric acid. AVOID poring azide-containing solutions to the drain; if it has to be done, neutralize the azide first. (See below). Explosive azide pockets may form, in the sewer and explode in an unpredictable manner or time. Avoid contact of naked skin with solutions containing azides or with solid azides. AVOID application of pressure or friction on solid azide, in particular dry solids. AVOID application of strong impact or sudden pressure or friction on solid azide, in particular dry solids. The AZD-N2 and AZD-P2 are detection cards for biological and pharmaceutical material which detect azides at concentrations greater than 50ppm and 100ppm respectively. The AZD-N2 card detects azides in a neutral solution ranges pH 5-8. 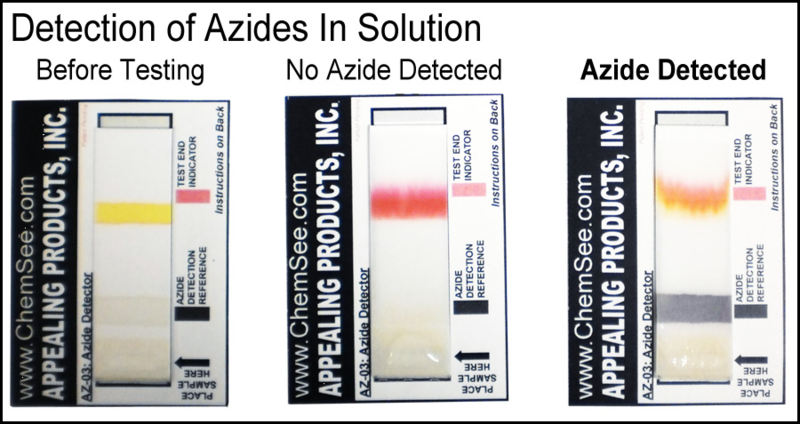 The AZD-P2 detects azides in basic solution ranges pH 8-14 and the kit includes a sample pretreatment pouch which safely brings the solution to an acidic range without the exposure to hydrazoic acid. The picture on the top left shows an example of an azide detection card as it comes out of the packaging. The picture in the middle shows a negative sample while the one on the right shows a sample contaminated with Azides which forms a dark-grey band which is easily distinguishable. The AZD-N2 and AZD-P2 are stable in ordinary storage conditions and have shelf life of at least two years. Never the less, it is recommended that they will be stored in a cool place. ChemSee’s KT-06 and KT-06R food poison detection kit offers comprehensive coverage for all common food poisons. 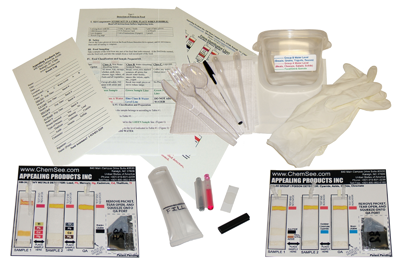 This kit offers a portable way to detect food poisons including azides in the field. This is done by cutting the food sample into smaller pieces with the included utensils and placing them in the provided container. The container is then filled with the appropriate amount of water designated upon which type of food it is. With the provided eye dropper five drops are placed on the CA-61 Cyanides, Azides, Sulfides, and Chromates detection card. If a poisoned sample is present a band of color will form which can be identified using the color comparison reference. The AZD-BDEC kits for neutralization and decontamination of azide-containing solutions with pH greater than about 8.5. Azides-containing solutions, once properly neutralized using ChemSee kits, may be disposed of in normal sewer. Make sure however that you follow the disposal of the waste solutions with a flash of water no less than SEVEN times the solution volume. NOTE: Most modern sewer lines are properly vented. However, old sewer lines in places which were not designed to vent gases safely still exist. Disposal of waste solutions which contain materials such as formaldehyde, azide, various decontamination solutions, etc. should be done slowly while the waste solution is continually flashed with water. Please make sure the vent complies with ordinary safety regulations. Solid azides are very dangerous and may explode very readily. Applying friction or hard instrument to scrap azide residue from container walls or corners. (Very dangerous with azides of heavy metals). Shaking vigorously containers with a powder of solid azides of heavy metals. Mixing powdered azides with powders of metals such as aluminum or zinc. Mixing powdered azides with powders or films of halogen-containing polymers or liquids. Organic compounds containing chlorine, fluorine etc. can form explosive mixtures with powders of azides. Acidifying mixtures containing solid azides should be done only if absolutely necessary. Acidification should always be done in well-ventilated location and with as dilute acid as possible. Acidify the mixture in small batches at a time. If the acidification is not done in a hood, use a gas mask and protective suit. Since each azide handling case is somewhat different ChemSee/Appealing Products customers may contact ChemSee or Appealing Products before trying to neutralize solid azides to discuss their special circumstances and thus minimize safety risks.